« How does thrombus look like in coronary angiogram ? In the management of CAD , cardiologists attack the lesion , surgeons avoid the lesion . . . who is the winner ? Coronary atherosclerosis is the number one killer of mankind. Many would consider it as an essential process of aging .Modern life styles and habits make this appear very early in life . There is currently an endemic (or even a pandemic ) of CAD due to premature atherosclerosis. We need to recognise CAD is not a primary heart disease .It is an irony, heart is an innocent bystander to the biological derangement of coronary vascular system when it is infested with atherosclerotic plaques . So , when we are confronted with serious atherosclerotic lesions in a coronary artery what shall we do ? Take on the enemy in a direct confrontation (Like war on terror ) : This is some times called as Interventional cardiology .Caution is required as the battle is within the human coronary artery , cross fires and collateral damage are unavoidable. 2 .Next method is to find the basic cause of terrorism , identify the perpetuates, facilitators and try to correct the root cause of it (CAD ) .This approach also refered to as medical management in cardiology community* . It aims at regression of plaque by statins, and life style modification and preventive cardiology. This modality is most ridiculed and insulted by the main stream cardiologists. 3. And third option is a real surprise ! This neither confronts the lesion nor does it address the initiating factors . It just ignores the lesion and by pass it with a LIMA /SVG fly over , as if nothing has happened in this vital high way leaving the culprit scot-free .This option is executed by surgeons as CABG surgery . . . and for mysterious reasons this is a well accepted one . CABG :Here the atherosclerotic burden is untouched by surgery . The graft can get diseased sooner or later , native vessel disease shall progress some times encroaching the ostia of distal graft site . Incidence of acute coronary syndrome following CABG is not greatly reduced for the simple reason we are not doing anything primarily to the inflamed plaques .These issues are left , to be taken care by the medical management . * This article does not want to defame these great development in cardiology(PCI/CABG) . They have a specific role to play. CABG AND PCI remain the only option for critical lesions with limiting angina .But please remember without proper medical management ( ie Targeting the perpetuates of crime ) both PCI and CABG will be a big sham ! Avoiding the lesion or attacking the lesion is a primitive method to tackle CAD . Passifying the lesions in a slow and gentle manner, preventing further progression or regression of lesions is the only “sane” method for combating CAD . PCI and by pass surgeries can be termed as 21st century’s medical adventure sports which has limited role , in the overall control of CAD for the human kind . And now answer this question . 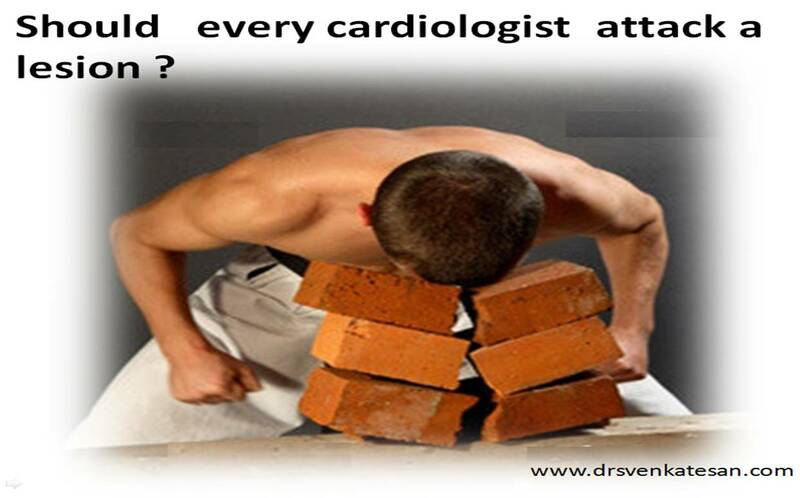 . .
Cardiologists attack the lesion and surgeon avoids the lesion ? Who is the winner in our fight against CAD ? Both of them are clear losers .The winners are all those humble physicians and parmedical workers (or even the responsible lay public ) who help recognise the early forms of CAD and counsel properly to prevent it . This is what Dean Ornish in 1991 documented in Lancet which was never considered scientific for the simple reason it has no commercial value ! I like the way you explain the whole treatment in simpler manner. COURAGE Trial also raised the similiar controversy. What is your opinion on Aggressive Medical management and Life style modification followed in the COURAGE Trial, implication of the same reults in routine clinical practice. Doctor Sir, i am appreciating your views, which is totaly different from the views of most of the Cardialogists. Further, you are the one quoting the Dean Ornish program. Also, We should not forget the views of Linus Pauling on CAD. He is the only person, won two undivided Nobel Prizes for chemistry and peace. But the conventional Cardilogists / pharmas not agreeing his points on vitamin therapy, because of the same reason (no Profit).